The love affair between New York City and bagels go way back; the boiled and baked bread product was brought over by Polish Jewish immigrants in the 19th century. 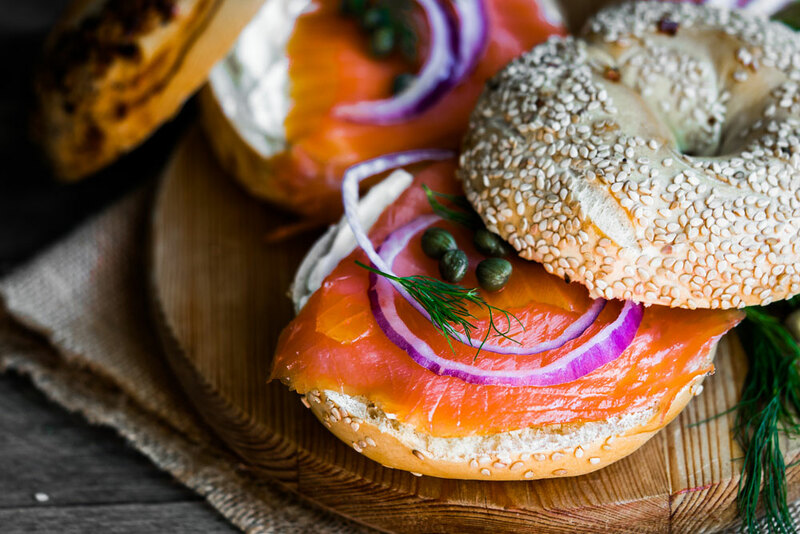 Lox-and-a-schmear (smoked salmon and cream cheese on a bagel) was madly popular in early 1900s Manhattan and has since been regarded as a quintessential part of New York eats. You can’t leave New York City without trying a bagel, and they’re usually so big they’re bound to keep you full for hours. This quick-moving bagel shop is right in The New Yorker Hotel's backyard. After 9 a.m., Best Bagel & Coffee has a line out the door, but it moves quickly and efficiently. Order from the right, pick up and pay on the left. The bagels are humungous, doughy and soft, made on site. While in line you can watch small batches of bagels boiled and baked. Cream cheese portions are generous and Boar’s Head meat cuts and other options are available for those who want more than a typical bagel. Seating is limited, but turnover is quick. Get in before 9 a.m. to beat the line; however it’s an impressive rate at which the line moves and a fun sort of experience if you’re visiting. You’ll feel victorious at the end with a big, doughy bagel. How to get there: From The New Yorker Hotel, take a right on 35th Street toward 7th Avenue. Before you hit 7th Ave., Best Bagel & Coffee will be on your left. Classic, thick NYC bagels with a lot of menu options. Murray’s opened their doors in 1996 and has stuck around because of their consistency. The scallion cream cheese is our favorite. Murray’s is a popular bagel shop so expect a line … and make sure you’re in the right one, as there’s one to order and one to pay. Luckily you can skip the rush -- they’re open til 9 p.m. in case you happen to be craving a bagel in the evening. How to get there: From The New Yorker Hotel, walk just one block to 34th St.-Penn Station. Take the 1 Line going downtown toward South Ferry. After four stops, get off at the 14th Street Station. Walk down 7th Avenue and take a left on 13th; Murray’s is at the corner of 13th Street and 6th Avenue. Some say these are the best bagels in NYC, and because of this, the wait to order can be lengthy. Still, Ess-a serves a special bagel that has a perfect chewy consistency with crisp outside, and there’s no shortage of cream cheese options (chocolate chip anyone?). Signature sandwiches are lavish but can run up to $16. There is an express line if you’re not feeling up to the wait, which is for customers ordering a bagel with cream cheese (served on the side) or a plain coffee. We suggest you get there before 8 a.m. to enjoy these delicious bagels and avoid the line. How to get there: From The New Yorker Hotel, walk to Penn Station (34th St. & 8th Ave.). Take the E train going uptown toward Jamaica Center - Parsons/Archer; after 5 stops get off at Lexington Ave/53 Street. Walk down 3rd Avenue two blocks until you cross 51st Street; Ess-a will be on your left. This 24/7, no-frills bagel shop is one of our favorites. It doesn’t draw the tourist lines seen at other spots, but it’s quick, tasty and close to Central Park. NY Jumbo Bagels aren’t super jumbo and cream cheese options are standard; it also serves Middle Eastern fare (falafel, shawarma and other goodies). Bagels are soft and crunchy on the outside. We suggest the Black Russian - a pumpernickel everything bagel. Did we mention this place is open 24/7? How to get there: From The New Yorker Hotel, walk to Penn Station (34th St. & 8th Ave.). Take the E train going uptown toward Jamaica Center - Parsons/Archer; after 5 stops get off at Lexington Ave/53 Street. Walk along 53rd Street headed toward 2nd Avenue, where you’ll take a left. NY Jumbo Bagels is up three blocks up on the left, on the corner with 56th Street. For real-deal lox-and-a-schmear, look no further. Zucker’s has the freshest tasting smoked salmon in town, and their hand-rolled, kettle-boiled bagels are classic, dense NY bagels. There’s seating at both locations and usually a bit of a line -- we suggest you know what you want before you order as the service has a reputation for being frank. They serve a surprisingly delicious cup of coffee, which they have on draft. Midtown - It’s a mile walk from The New Yorker Hotel to this location. Head southeast on 35th Street toward 8th Avenue, and stay on 35th for .8 miles. Take a left on Lexington; Zucker’s will be five blocks up on the right before you hit 41st Street. Tribeca - Head to Penn Station from The New Yorker Hotel and take Line 2 (red) toward Flatbush Ave/Brooklyn College. After two stops, get off at Chambers St. Subway Station. Head northwest on Chambers Street toward Greenwich; Zucker’s will be on your left.